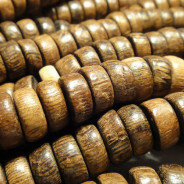 Kamagong (Tiger Ebony) Wood Beads Round 8mm (~50pce Strand) - 40cm/16'" Strand. 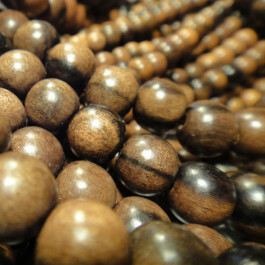 Tiger Kamagong beads - Also called Tiger Ebony - are made from the Kamagong “Mabolo” fruit tree found only in the Philippines. 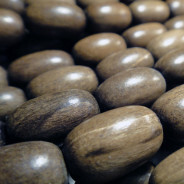 The wood is extremely dense and hard and belongs to the ebony family (genus Diospyros). The word Mabolo is Filipino for hairy and describes the fruit’s hairy exterior. It is an endangered tree species and protected by Philippine law. 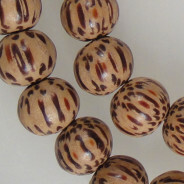 These beads are handmade from natural materials. Please be aware that there may be some variance in the shape, size, hole size and colour may vary slightly from our website image between batches. Please note the quantity of beads per strand are estimates only. 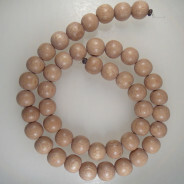 These ebony beads can vary in colour from shades of black, brown and soft pink.